WOOSTER, OHIO — I am safely home far too early from my China adventure, and here begins a painful tale. I tell it first to complete the 2014 China Expedition story, and because there may be some lessons for geologists on field trips far from home. It is also a record to remind me of unexpected events in the field. I’ll say at the start that I’m fine now and was never in danger. 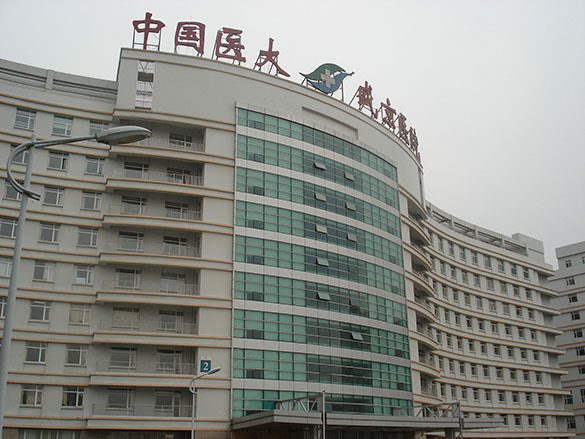 After walking to one hospital (which was actually less painful than sitting), we were directed to another with better facilities: Shengjing Hospital of China Medical University (shown above with a Wikipedia image). We took a taxi to get there. Quick-thinking Yongli telephoned his wife, Wang Fei, to meet us there because she had better English skills for translation. She was a critical player for the next several hours. Alas she now only knows me as a grimacing American gamely smiling through a long series of procedures and waits. She and Yongli were fantastic, supportive and generous friends of mine during this odyssey. They were, in fact, my only friends in China, and I had just met them. The emergency room at Shenjing Hospital is a series of large connected spaces lined with various medical speciality stations. There were hundreds of people there when we arrived. Despite my first impression (and fear) of chaos, the medical system was efficient and effective. If I was in an American big city emergency room my time from arrival to diagnosis would have likely been the same. The processes, though, were very different from anything I’ve experienced state-side. Fei and Yongli first took me to a check-in at the “abdominal pain” counter. We received several slips of paper that would eventually be passed through stations, signed and stamped before and after procedures were completed. They next took me to the ultrasonic scanning station to get a slip of paper in queue, and then do the same for a CT scan. I was clearly not the only kidney stone sufferer there. I may have been Kidney Stone #12 for all I could tell. While we waited for these procedures, I joined a line to provide a blood sample. When my time came I just extended my arm and they did the job, applying tags to the vial to be delivered to the lab. At each station Fei would explain my situation to the nurses. Since there was always a crowd listening, I could tell when she got to the description when a dozen faces would turn to sympathetically gaze on my misfortune. I was the only Westerner I could see, but I heard there was another being shepherded around. After the procedures, we waited two hours for an assessment by a doctor. 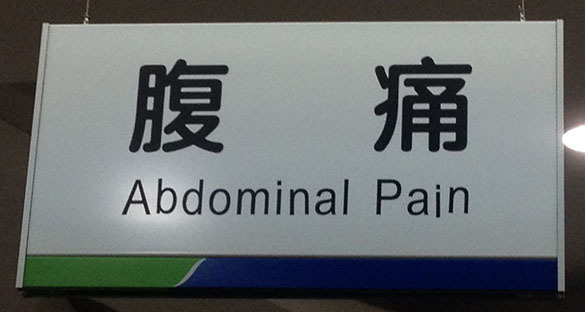 For that we returned to the abdominal pain counter. Fei worked her way in and talked to the doctor on the other side of a computer monitor (above). 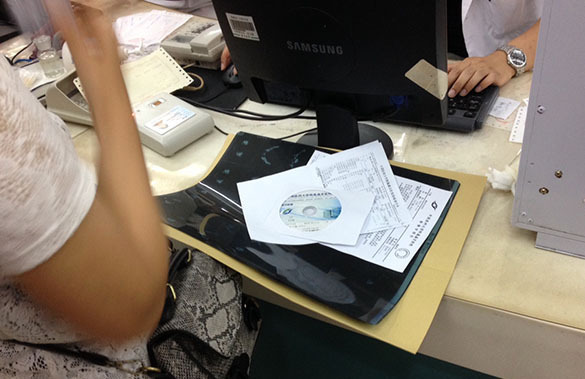 She had my analysis results and the CT scan summary film, along with a CD of the scan itself. The doctor, in one sentence as far as I could tell, said there was a stone indeed present, it was “5 millimeters”, and it “will pass”. Case closed. 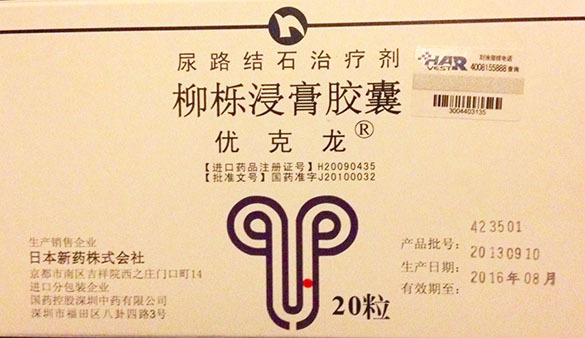 At that point with a diagnosis in hand Fei and Yongli went to the pharmacy counter and got the above pain medication. At least we thought it was for pain. Note how it is labeled specifically for kidney stones with the image. It is called “Quercus salicina Extract” and now I’ve learned from Mr. Google that it is a treatment directly for kidney stones. Whether it is an herbal remedy or effective treatment is something I’ll ask my doctor in Wooster tomorrow. It did nothing for the pain, but I imagined that it did. Lesson there. That evening the pain considerably diminished, so much that I thought the stone had passed and I would be OK. The next morning I was doing OK enough to leave with our team of four geologists on a flight to Guiyang, even enjoying a dinner there that night. The Fourth of July was pain-free. I didn’t know that the stone just found a place to rest. At dawn of July 5 in my Guiyang hotel room the pain had fully returned. I knew then I could not continue with the expedition. We were going to be driving for several hours into the countryside. The remoteness and chance of a complication, let alone the continuing pain, made it clear it was time for me to go home. My new colleagues were completely supportive and worked hard to get me back to Beijing and a flight the next afternoon to the USA. Because I had good wireless I could text my wife Gloria, who called our travel agency’s emergency number and booked me a new set of tickets. Professor Gong very kindly accompanied me on the flight from Guiyang to Beijing, and then booked me into a Beijing hotel for that night. He stayed there too, making sure I knew how to get to the airport and my flight on July 6. 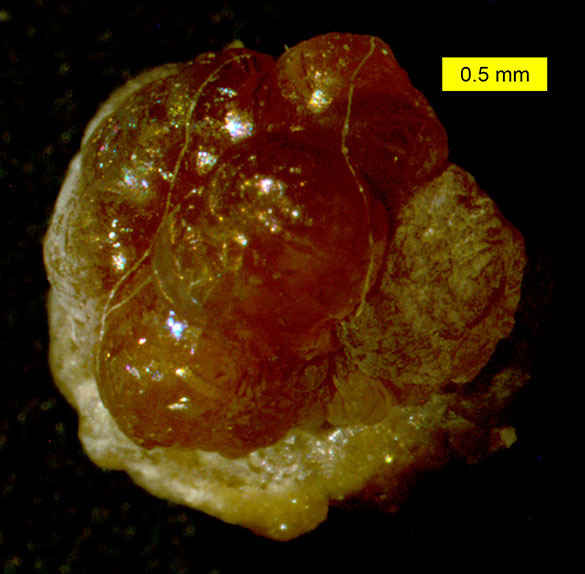 Soon after Professor Gong left Beijing to return to his home in Shenyang, my brutal little kidney stone emerged in my hotel room and I captured it. This good news meant my long flight back home would be far more comfortable. (The start in Beijing is recorded in the image above.) That was indeed the case, and I arrived in Cleveland at about 10:00 pm on July 6. Home and family never felt better. While that first side may look all smooth and rounded, this other side shows one crystal spike in the upper right still in place. There are many broken spike bases around the stone’s periphery. Evil, eh? 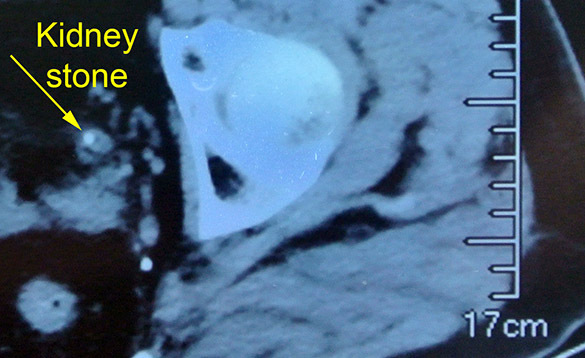 This stone will soon be analyzed in the Wooster urology lab to give me a better idea of how to prevent these from occurring again. 1. Have good colleagues in the country or region who know well the local language, customs and laws. My new Chinese friends were fantastic, even though my malady had disrupted elaborate plans made months ago. 2. 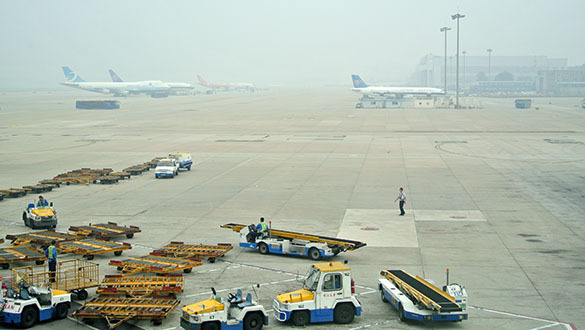 Book airline tickets through a good travel agency. We use the Professional Travel office in Wooster, with the incomparable Suzanne Easterling as our agent. She has saved us from travel problems numerous times, and when she is out of the office we are covered by a 24-hour service that is fantastic. It would have been very difficult for us to rebook tickets on our own, especially with me in extremis. 3. Bring a variety of electronic devices for communication. I had my iPhone, iPad and Macbook laptop computer. Often only one of these could catch the wireless signal enough to send and receive messages, and I could never predict which would be best. 4. Take all the medications you might possibly need. 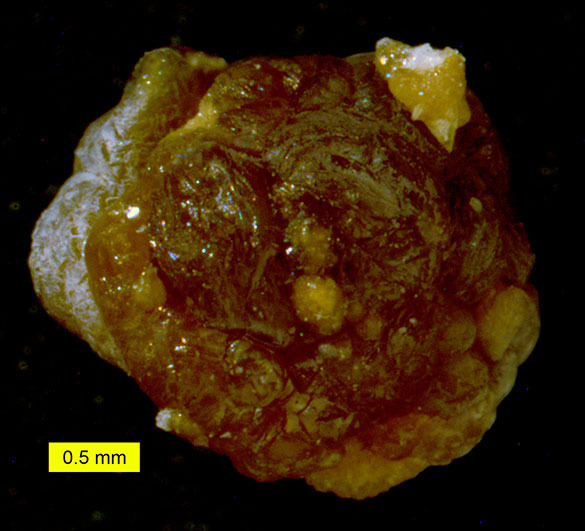 I was ready for intestinal disorders, infections, and malaria, and I had diphtheria and polio vaccinations in advance, but I didn’t imagine a kidney stone would chose this Chinese interval to start its fateful descent. I had no special pain medications other than aspirin — the good stuff is still sitting in my medicine cabinet at home. 5. Make sure all emergency numbers and addresses are easily available in a variety of formats. This is obvious to anyone who has taken students in the field. I print out and electronically store this information in multiple places. I could easily slip a list from my pack to show colleagues and officials. 6. For foreign trips, register your schedule with the State Department’s Smart Traveler Enrollment Program. I always do this when I’m taking students to Israel, but I didn’t even think of doing the same for me alone in China. I could have been admitted to a Chinese hospital, or been detained by the police, without any US representative knowing where I was. I had all the correct USA numbers, but on this trip I learned that making telephone calls in China is not easy for a beginner. 7. If you have a condition that might cause problems, have a medical analysis before a long trip. Now this looks painfully obvious. I didn’t think I had a “condition”, though, because I thought the lack of a stone in the past two years meant that my diet changes had eliminated the problem. That was naive. 8. Finally, listen very carefully to your body’s clues. I may have been able to detect that my stone hadn’t passed while still in Shenyang, thus cutting probably two days out of the time it took to actually go home. I think I denied the small signs because I so much wanted to go into the field. 1. I met my new Chinese colleagues. We had worked together on manuscripts in the past, but this was the first time we could talk. I like them very much, and they are enthusiastic about geology and paleontology. Zhang Yongli is very interested in pursuing fossil hard substrate studies like I do along with my friends Paul Taylor, Michal Zaton, Olev Vinn, Leif Tapanila and others. Yongli will be the first in China to do this in earnest, so he will make a huge contribution to the field. I hope he can visit me in Wooster so that we can study together the hard substrate collections we have and visit classic field localities. In a way we had a successful conference during this short interval. 2. I saw China! Shenyang Palace was an inspiring historical location, downtown Shenyang showed me a developed northeastern Chinese city in action, and Guiyang was an example of a lesser-developed southwestern city. I even got to taste the special air in Beijing. I saw everyday China, and I conversed with top Chinese geologists. With no exceptions Chinese people were kind, considerate and helpful everywhere I went. They smile and laugh often, which is a contrast to people in most countries I’ve visited. 3. Through my discomfort I experienced much compassion and understanding from people I had just met. I disrupted their plans, but they adapted and had not a whisper of complaint. My kidney stone was not life-threatening, so as far as medical emergencies go this was minor in scale and consequence. I had to leave a great field trip, though, without seeing the rocks and fossils. Way too bad, but such was fate. In her China travel advice to me before leaving, my friend Susan Clayton said, “Just remember if you’re uncomfortable with something on the trip that ‘this too shall pass’.” Who knew that she would be so literally correct! But I’m glad you’re feeling better. Mark, what a story! I’m sorry your trip ended so suddenly, even before the fieldwork had started, but delighted to hear that you made it home safely and fully recovered.